A gorgeous farewell to the trails for a little while. The weekend was absolutely gorgeous. A perfect weekend to be hitting the trails in Nottingham New Hampshire’s Pawtuckaway State Park. The atmosphere at the Vulcan’s Fury Trail Race was relaxed. I love this kind of trail race because while its about the running it is also about cameraderie and a little bit of friendly rivalry on the race course. 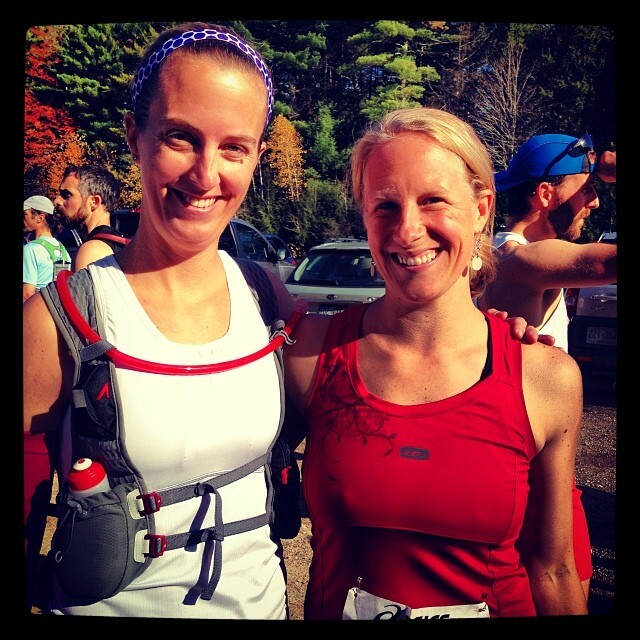 Friendly rivalries at the Vulcan’s Fury trail race make for some fast racing! I was very happy to see some of my good friends before the race, Annie of Core Nourishment and Simple Healthy Meal Plans and Sarah of Run Strong, No Regrets as well as an awesome Ultra Runner Friend Chris who has a son in my daughters kindergarten class. I was also inspired by meeting one of my readers who runs just for the love of getting out there for the challenge but also to enjoy the course and to be a runner. He let on as to how he was not the fastest but just runs because he loves it even taking on the challenge of the VT 50K a distance that I have yet to accomplish. Meeting someone like this runner gives me a renewed desire to find the love of run. Thank you for inspiring me Dave! The day started out very crisp and chilly. 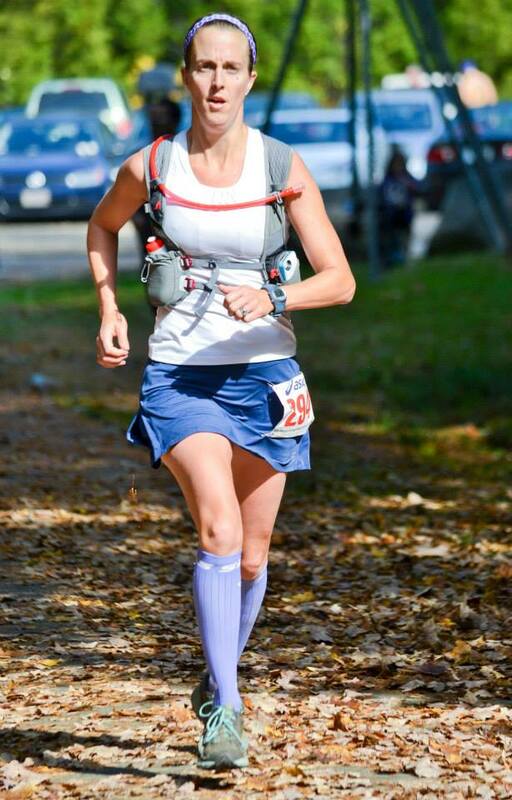 By the start of the race it had warmed up considerably leaving me happy to run in my Skirt Sports Wonder Girl Tank and Gym Girl Ultra Skirt. This is my perfect running outfit and I have absolutely no chafing whatsoever during my long runs. Me and my awesome friend Annie. The race started off at a fast pace. The energy of the runners was high. Out front for women were Ultra Runner, Danger Girl, Kristina Folcik-Welts and speedy ultra runner Leslie Beckwith followed by Sarah who has been having an amazing year of picking up speed. I knew I couldn’t hang with the speedy ladies but fell into a comfortable pace with my friend Annie close behind. Peroneal Tendons beware, these trails are rugged! The trail was beautiful with yellow and red leaves covering the trail. While beautiful this made it somewhat difficult to navigate over the roots and rocks hiding underneath. The smooth leaves were also slippery. I have been feeling uneasy on the trails anyways. I have not been trusting my footing at all on the trails since I started running again after my brief stint in the boot. I was feeling ok until around mile three when we negotiated a stream crossing an shortly after hooking my foot on a stick my left ankle completely collapsed under me and it hurt! Annie stayed with me for a minute but I urged her to run on ahead as I worked to shake off my frustration and hoping my foot was ok. I was able to run through it (perhaps not a good idea?!?!) and continued on my way. The next several miles were mentally tough. thankfully the scenery was gorgeous with trail winding through a giant boulder field, a climb up to a fire tower with awesome cheering and a cowbell from another running friend Carolyn at the top, and gorgeous views along a pond. A dog on the trail? . . . maybe this dog likes to race just like Boogie, the half marathon finishing chocolate lab! After shaking this off and settling back into a comfortable pace (at this point I was alone on the course) I began to notice the pitter pat of little feet crunching through the leaves in the woods. All of a sudden a little black and white Boxer type of dog popped out of the woods onto the trail in front of me. I wanted to take a picture because he made me giggle but my camera had died at this point. This little energetic dog stayed with me for about the next 3-4 miles and brightened my mood considerably. He even snuck up on another runner creating an obstacle course moment along the trail which we both laughed about. This dog reminded me of the recent story being passed around the web about the chocolate lab, Boogie, who finished the half-marathon and won a medal(a must read story!). Finally, I moved into the last stretch of the race, losing the dog and also losing my way. Thankfully I was not the only one! It is always a trail runners greatest fear that he/she will take a wrong turn and end up in the woods in the middle of nowhere. It took several wrong turns and some hysterical comments about how the dog had probably already completed the course ahead of us. Finally we found our way and the runners spread out each digging in deep to finish the race strong during the last mile. 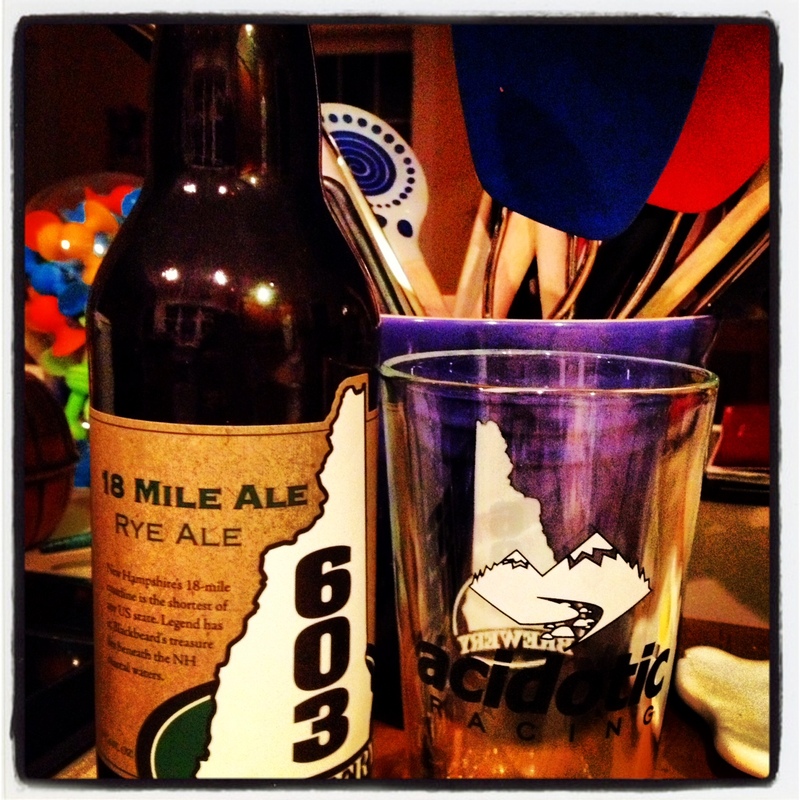 Thankfully this wasn’t an 18 mile trail but I did win some 603 Brewery 18 mile ale! With about 1/2 mile left I rolled my left ankle again. It hurt a lot. I was wincing and paused again but pushed through to the finish. My finish time was a well earned 2:19 for a total of about 11.5 miles (did you know this course had a mystery distance?). Not my fastest time but I was happy to have run even if the day had challenged me. We were rewarded at the finish line with hot vegetable soup which tasted amazing and I was excited to learn that I had won a 603 Brewery 18 Mile Ale and Pint glass in the raffle. Plus its always great to share trail stories with the other runners after the race too! Now I must nurse my foot and my ankle. My peroneal tendons and the surrounding muscles are sore from the ankle rolls. For now I think I’m best off sticking to more solid ground on the roads. I’m not sure that my foot can take another beating! This is ok because in January it will be time to hit the roads for training for the Boston Marathon! Tell me about your racing adventures this weekend! Do you have any funny stories to tell? I had a 50K trail race I ended up stopping at. I’m actually much stronger and better on the road than the trails but they’re just too beautiful to resist! Get better and heal fast! Thanks Liana! I still have a goal of completing a 50K but right now that’s on hold so I can get strong for Boston in April. Do you have any big races coming up? I’ve only run one Acidotic Race and loved it. Holy giveaways! Hope you foot is feeling OK. I’ve been tempted to run on the trails more but am afraid of doing the same thing. Thankfully my foot is okay for road running so I am taking a hiatus from trail running for a bit and am going to work on getting strong for Boston. Although I hope to be back at trail running next summer. Perhaps we could plan to go to a trail race together. There are so many awesome ones in NH! How is your PCL injury? I am hoping it won’t keep you from running for too long? Injuries are such a drag. Once you have healed do you think you will run another marathon? Thanks for checking in!